As Rally Poland returns to the FIA World Rally Championship (WRC) for the first time since 2009, the M-Sport World Rally Team will be looking to defend their previous form having claimed victory with Mikko Hirvonen five years previously. The team’s past experience will prove vital when it comes to understanding the nature and character of the Polish stages, but with much of the route differing from the former encounter, the crews will need to muster all of their concentration and precision as they tackle what is effectively a brand-new event. Based in the Masurian town of Mikolajki, the rally will also venture into neighbouring Lithuania for more high-speed kilometres. As well as being extremely fast, the sandy stages provide a slippery affair and the tree-lined route hides a multitude of obstacles which threaten to ensnare any crew who venture even slightly off line. If that weren’t enough, the region’s unpredictable summer can play havoc with strategies. The threat of rain is ever present and shrewd tyre selections can make all the difference. This is a rally in which the team need to apply all of their knowledge, skill and experience, but speed is arguably key. The fast gravel roads of Poland’s Lake District have been likened to those in Estonia and Finland, something which is sure to be an advantage to M-Sport’s resident Finns. Hirvonen and co-driver Jarmo Lehtinen know what it takes to succeed in Poland. Having won the event in 2009, the Scandinavian’s Ford Fiesta RS WRC will be a real contender for the podium. The fast, flowing stages suit Hirvonen’s fearless style, and the well-honed pacenote system which he and Lehtinen have developed over their 10 year collaboration will provide the ideal base from which to demonstrate their speed. In the sister M-Sport Fiesta RS WRC, Elfyn Evans goes to Poland with his confidence high. The Welshman was pleased to see some encouraging progression at the previous outing in Sardinia and he will be looking to carry that momentum forward. Most importantly, the fresh stages offer a level playing field from which Evans and co-driver Daniel Barritt can compare their speed and style to their rivals; without the advantage of past experience. With 90 per cent of the route new to all crews, next week’s event acts as an opportunity for the Welshman to determine more specific areas for improvement as he continues his development at the WRC’s highest league. “This is an event that I really enjoy and we won in 2009 so I’m looking forward to returning to Poland next week. We have a good idea of what to expect in terms of the conditions, but the stages themselves will be almost completely new. “Historically, I’ve always felt quite comfortable at new events so we’ll be looking to be in the fight for the top positions. Jarmo [Lehtinen, co-driver] and I will be making new notes for most of the stages, but that doesn’t really faze me as I’ve always been confident in our ability to do that. “The stages are very fast and in some ways you could compare them to those in Finland, but the surface is completely different. In Finland the gravel is quite hard, but in Poland it’s really soft and sandy which means that they can become fairly rutted for the second pass. “This is another new event for me, but the difference is that it will be new to a lot of other crews too. It offers something of a level playing field – certainly more so than any other event this year. “For me, the first pass will just be about checking the notes in what is likely to be a very fast rally. But if the feeling is right, it would be nice to pay a bit more attention to the times over the second loop and really concentrate on improving the driving technique. “From what I’ve heard, the stages are all really high-speed and the soft, sandy surface means that they could become quite rutted for the second pass. I’ll be sure to speak with Mikko [Hirvonen] and Jarmo [Lehtinen] on the event to get their thoughts on the stages and how best to tackle them. Their experience and advice has been a real benefit for the new events and I’m sure it will come into play again next week. M-Sport’s range of award-winning rally cars has once again dominated the entry list. With 39 of the 71 competitors opting for the Ford Fiesta, a record-breaking 55 per cent of the field will line up behind the wheel of M-Sport machinery – a statistic that sees Ford’s presence more than double that of the next most popular manufacturer. 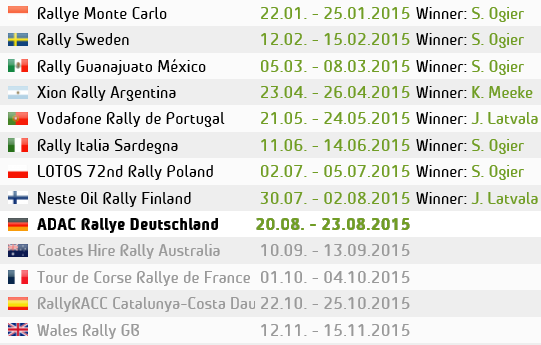 Seven Fiesta RS WRCs have been entered. Alongside Hirvonen, Evans and Robert Kubica, M-Sport will also run the Fiesta RS WRC of Henning Solberg who makes a welcome return following a string of standout performances on gravel. In the WRC2 category, M-Sport can boast an impressive 65 per cent of the field with the Ford Fiesta R5 proving to be the model of choice. Being run by M-Sport in identical Fiesta R5s are Peruvian Nicolás Fuchs and Frenchman Bryan.